Comments: Deciduous broadleaf native to Japan and China. Compound leaves 6" to 10" long with alternate ovate green leaflets. Pea-like flowers are creamy white to pale green, and the bark is vertically furrowed and brown. 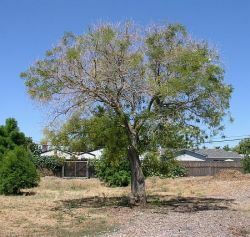 Very similar to Black Locust in look, but the Pagoda tree doesn't have thorns.